BANGKOK, Thailand, March 4, 2013 (ENS) – Welcoming the world’s wildlife regulators to Thailand Sunday, Prime Minister Yingluck Shinawatra promised to amend Thai law “with the goal of putting an end to the ivory trade.” But she gave no time frame for implementing the landmark offer. Greeting 2,000 participants from over 150 countries to the 40th anniversary Conference of the Parties at the Convention on International Trade in Endangered Species, CITES, the Prime Minister said elephants are part of Thai culture. 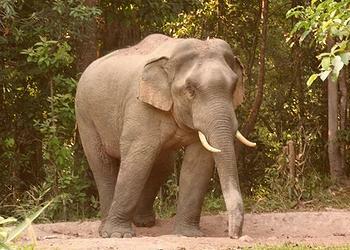 Still, Thailand is one of the world’s largest ivory markets. The country now allows trade in tusks from domesticated Asian elephants, but conservationists warn this legal trade is exploited by criminals to sell poached African ivory. “Since the Prime Minister did not announce a detailed timeline, we must remain vigilant – even during this two-week convention – to push for timebound steps to ensure that this promise becomes a reality,” said Roberts. “Wildlife crime has recently been referred to by the UN Security Council, which has linked the Lord’s Resistance Army to illicit trade in ivory in the Democratic Republic of the Congo,” Scanlon said. “These criminals must be stopped and we need to better deploy the sorts of techniques used to combat illicit trade in narcotics to do so,” he said. As the tri-annual conference opened, news came that the Democratic Republic of Congo’s largest remaining forest elephant population, located in the Okapi Faunal Reserve, has declined by 37 percent in the last five years, with only 1,700 elephants now remaining. Population surveys by the New York-based Wildlife Conservation Society and DRC officials show that 5,100, or 75 percent, of the reserve’s elephants have been killed in the last 15 years. 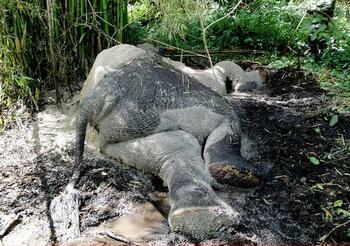 The DRC survey comes in the wake of another grim report in February from Gabon where 11,000 elephants were slaughtered in Minkebe National Park over a 10-year period. His Royal Highness Prince William, Duke of Cambridge, also expressed concern. In a video statement, Prince William called for the parties to work together to reverse the “current alarming trends” in the illegal killing of African elephants and rhinos and the surge in illegal trade of ivory. China is determined to work with the international community to curb ivory trade and protect wild elephants, Chinese officials said in Bangkok today. Submitting its “Ivory Trade Report” to the conference the Chinese delegation outlined the nation’s effort in combating the illicit ivory trade and the measures for protecting wild elephants. Meng Xianlin, executive director general of China’s Endangered Species Import and Export Management Office, told the state news agency Xinhua that China does not ban domestic trade in ivory but sets the limit of legal consumption at six tons per year. The ivory allowed for sale comes from two sources: ivory that was imported before CITES took effect and those bought by China from four African countries’ stocks as permitted by CITES as a one-time sale in 2008. 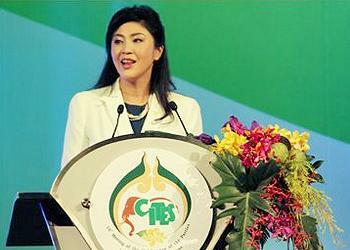 All other elephant tusks circulated in the market are labeled as illegal, says Meng. Chinese customs officers are taking concerted and effective moves to crack down on ivory trafficking and trade, he said. China, a target for ivory dealers, has been helping African countries set up monitoring systems for the protection of elephants and to improve the livelihood of local residents, said Meng. The European Commission is to contribute nearly two million euros to the international police agency Interpol in support of its efforts to combat wildlife crime and protect the world’s natural resources from the illegal international trade in wild plants and animals. Over the next three years, funding worth 1.73 million euros will support Interpol’s Project Combat Wildlife Crime. Some of the funding will go to the CITES Secretariat, the UN Office of Drugs and Crime, the World Bank, and the World Customs Organisation.